Debut album to be expected in the fall! 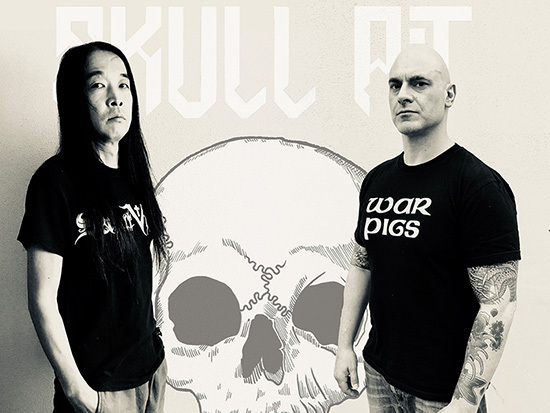 Metal Blade is happy to announce the signing of SKULL PIT, a new band featuring the talents of Mem V. Stein (EXUMER) and Tatsu Mikami (CHURCH OF MISERY)! SKULL PIT is a tale of two musicians from opposite sides of the heavy metal spectrum and the planet. One hailing from Tokyo/Japan, the other from New York/USA and meeting each other in cyber space in order to strike up a friendship and musically celebrate the spirit of their youth. Prior to writing and recording SKULL PIT‘s debut album, founding members of EXUMER, Mem V. Stein, and CHURCH OF MISERY‘s, Tatsu Mikami , corresponded for some years online due to their mutual love and respect for each other’s band, before embarking on their own joint venture. The two veterans endeavored to combine their favorite elements of bands like Motorhead along with the countless outfits of the New Wave of British Heavy Metal into one blistering and highly energetic album. The songs on SKULL PIT‘s debut are a clear departure from what EXUMER or CHURCH OF MISERY usually sounds like. Stepping away from EXUMER‘s lighting fast rhythms and CHURCH OF MISERY‘s slowed down Iommi inspired riffs, SKULL PIT creates melodies in the vein of 70s hard rock and 80s NWOBHM with Lemmy’s punk attitude. The debut album of SKULL PIT will drop in the fall of this year, stay tuned for more info to pop up in the next few months!